I've got the most amazing connected hifi - and it cost about £90. Through TuneIn, I can access almost any radio station on the planet. (Not quite - some aren't compatible - but most are). With Google Play Music (or others), I can listen to my own music and have access to millions of tracks on subscription. Using NPR One, I can enjoy interesting quality speech radio, as well as all my favourite podcasts with Player FM. It's really easy to control. And it sounds amazing. I previously managed this with a Chromecast, and an HDMI dongle. 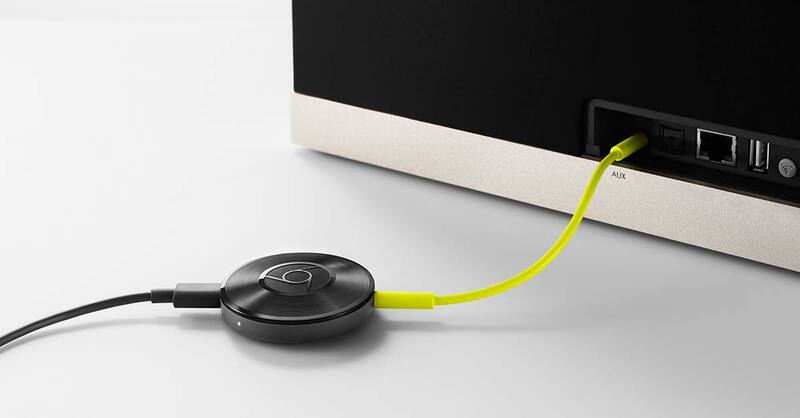 But with the release of the Chromecast Audio, it's now even easier. A Chromecast Audio is a little puck-shaped thing that almost literally connects the internet to your speakers. A Google Chromecast Audio. You can't buy these from Amazon, because of some bizarre policy, but you'll find them in most other stores: in the UK you'll find them in Currys, and in Australia, they're in JB-Hifi. It comes with a suitable cable. Google Play Music All Access for music - Android iOS. You could also use Blinkbox Music, Deezer, or Rdio among others. TuneIn for live radio - Android iOS. Player FM for podcasts - Android. For iOS (or Android), try Pocketcasts. With Android, you can also cast your whole screen, including the audio, to your hifi for any unsupported apps you might use. You can also cast a whole browser tab in Chrome, too, on your laptop. (Like Bluetooth or Apple Airplay, this does use lots of battery and transcodes the audio). Great speakers with proper stereo separation (!) makes an amazing difference to the quality of the audio; while the user interface of most phone apps will always beat lots of button pushes on an over-complex remote control. It's now my office hifi; and I'm delighted with it. This is awesome stuff, thanks; been pondering a set-up along these lines for a while. I think your third hardware bullet is ambiguous; you mean "An HDMI audio/VGA adaptor and an HDMI female-to-female adaptor to get the audio from the Chromecast into your amplifier" - "this device" initially read to me like you were referring to the first adapter, which didn't make sense. Cheers. Yes, I've had a few questions on Google+ about that, so I've made that a little clearer in an edit. I bought the HDMI female-female adaptor to enable me to connect the Chromecast to the audio/VGA adaptor. It was cheaper and quicker than getting an HDMI audio/VGA adaptor in the right orientation. I have a high end system with a Chromecast plugged into it. The only audio source I regularly use apart from the Chromecast is the turntable. All other sources, (CD, tuner etc) are redundant. I have a sonos, love it. Hope sonos bring google cast for audio to their devices though as it would open up the uses for it. Can you post a photo/image of how you hooked everything up e.g how you connect the chromecast to the amp. Could you do the same with an existing hi-fi and a chromecase? Mark - sure. Here's the Chromecast, connected to the gender changer then the VGA/audio adaptor (in blue). It then connects using a 3.5mm jack to the amplifier. I actually keep the Chromecast dangling behind the desk, so it looks a little neater than this. And yes, you could do the same with an existing hifi. The reason I didn't do that is that I don't have one; and I didn't think I could get an amp for just £25. So, I received all the magical items today and put it together in moments. I've used my pre-existing stereo and swapped out a fuzzy and crackly bluetooth based solution. BONUS 2: Finding out chromecast works on Podcast Addict, my current podcast app of choice (Android, free, and fantastic). I've got a 'Camac' HDMI to VGA+audio dongle, which looks identical to James' (but is black). Alas, no meaningful sound comes out - until the VGA output is plugged in to something that terminates it (a television that's not plugged in to the mains works just as well as a television that's switched on and showing the video). Perhaps I need to make a VGA dummy plug...? To answer my own question, if anyone finds themselves in a similar position: yes. Three 75 ohm resistors, one across each of R, G, B and ground - and it now works as an audio-only device. Factor in spending £1.17 at Maplin. Something worth knowing for temporary radio stations or just a radio station experience from a laptop: Flair Player is a free app for Chrome, which has full Chromecast support. So if you find a .pls you want to go and have a listen to from your laptop, this works just great. Nothing as small as that. I have a Rotel Amplifer, for which I have a Revo Axis wi-fi radio plugged in via an audio switcher box. I still have a Pioneer F520RDS tuner that's rarely used, as well as a Linn Deck for vinyl, a Marantz CD player, a Sony minidisc, a Denon twin cassette deck, plus a few old mobile phones tha I use as music players. The audio from my TV is also plugged into the hi-fi system, via the audio switcher box, as as my Sky receiver. Meanwhile my TV has 2 DVD players, a ROKU flash drive, an Android-for-TV flashdrive, the same Sky receiver as above and built-in Freeview. All audio leads are Chord Chrimson's. The sound quality off many internet stations and Spotify as really very good.